Brazil’s planning minister, Romero Juca, announced he will step down after secret recordings revealed his plot to oust President Dilma Rousseff. In the audio, released by Folha de S. Paolo on May 23, Juca is heard discussing a plan to push for Rousseff’s impeachment in an effort to stall a massive corruption investigation into the state-owned oil company Petrobas, which has implicated many Brazilian politicians. Juca is a close ally to current President Michel Temer. However, many of Temer’s allies have called for the minister’s firing or resignation, including a senator who is under investigation in connection to Petrobas. Juca announced he was taking a leave of absence just days after he assumed his post. “I don’t want these manipulations to harm this new administration,” he said in a press conference. Juca also said Temer could decide whether he should return once the accusations were cleared. The secret recordings were of a more than an hour-long conversation between Juca and Sergio Machado, a former senator who was recently in charge of another state-run oil company, Transpetro. It was recorded in a meeting in March at Juca’s home, just weeks before the nation’s lower Chamber of Deputies voted to send Rousseff’s impeachment measure to the senate. Machado is negotiating a plea deal, according to local media, who also reported that Machado recorded the conversation with Juca and other politicians in a negotiation with the attorney general’s office. In the recordings, the minister said he wanted to keep Judge Sergio Moro out of the Petrobas investigations linked to him, other people in President Temer’s inner circle, and Senate President Renan Calheiros. “We have to solve this. We have to change the government so the bleeding is stopped,” Juca said in the recording, according to the Folha S. Paolo. Machado responded: “The easiest solution is to put Michel in.” Juca agreed. The minister said he had talked to justices in Brazil’s top court and heard that the media and other institutions would decrease the pressure once Rousseff was ousted. Juca also said key Rousseff opposers, including defeated presidential candidate Aecio Neves and new Foreign Minister Jose Serra, were “all on the tray to be eaten” by the Petrobas investigation. 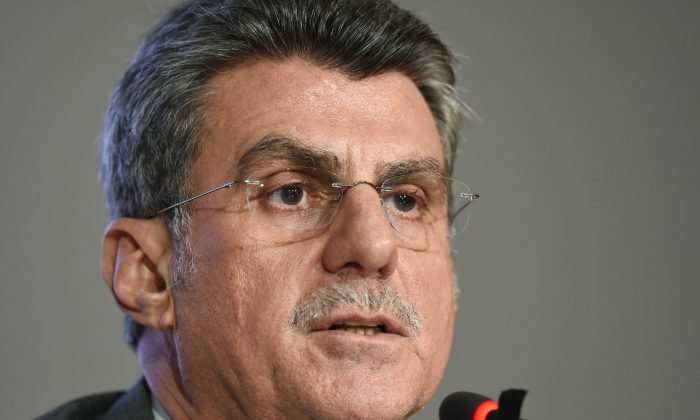 In a news conference after the recordings were released, Juca said the “bleeding” he mentioned in the conversation had to do with the nation’s economy—although he did not speak about the economy. He also denied trying to stall the investigation. Rousseff was suspended from her post earlier this month for alleged corruption. Rousseff and her supporters argue that her administration was the victim of a coup by opposition lawmakers to weaken the Petrobas investigation. “This shows the true reason behind the coup against our democracy and President Rousseff’s mandate,” tweeted Ricardo Berzoini, former minister of political relations who lost his post when Rousseff was removed from office. “Their objective is to stop the Petrobras probe, to sweep the investigations under the rug,” he said.